Johannesburg based Digital Fabric has specified Philips Selecon luminaires to help bring the newly completed //hapo museum to atmospheric and theatrical life. 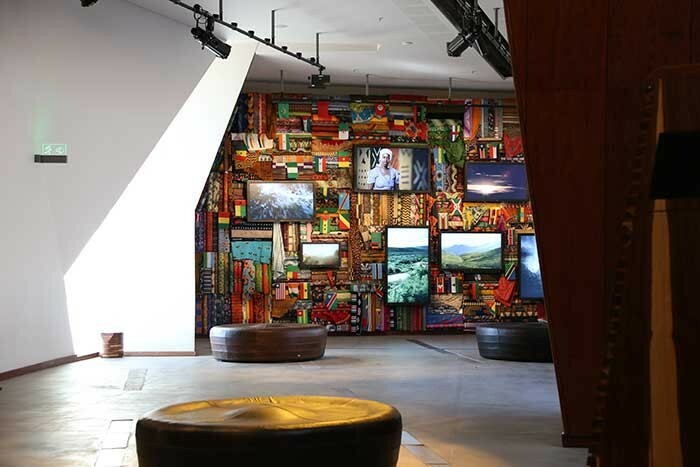 //hapo's vision was clear: to create an interactive exhibition space where the story of Southern Africa, dating back 3.6 billion years, unfolds in an engaging narrative and visual form. The museum is split into a number of zones and scenes, each telling a different part of the African story. Lighting is used to evoke the feel and atmosphere of each scene presented. Designed by a collaborative team of South African architects from Mashabane Rose, MMA and GAPP, Johannesburg based Gavin Olivier of Digital Fabric conceived and managed the technological aspects of the project. In the process he called on some of South Africa's leading integrators including: TDC Africa and DWR Distribution to deliver the lighting solution. 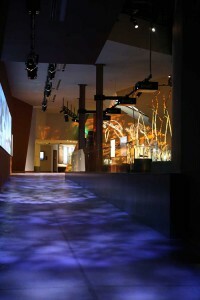 Inside, the spaces are brought to distinctive life by evocative sculptures, artefacts and information pieces, complemented and supported by carefully prescribed lighting. Augmenting the numerous bespoke solutions for each zone Oliver specified an extensive stock of Philips Selecon fixtures, namely 66 Philips Selecon Display 25˚-50˚ Zoom Profiles, 54 Philips Selecon Display 15˚-35˚ Zoom Profiles and 118 Philips Selecon Wing asymmetrical floods. "Principally, our challenge was to create a system that was operationally simple and sustainable, yet equally, would deliver a feature rich experience for visitors," explains Olivier. "We engaged theatre lighting designer Declan Randall to offer his creative thinking when it came to lighting fixture positioning and focus decisions. In addition well-known TV and music lighting designer Joshua Cutts of Visual Frontier contributed to the final focus sessions." The Selecon luminaires were supplied and installed by Johannesburg based, DWR Distribution. Managing director of the company, Duncan Riley, comments: "The team chose the Selecon display profiles because they offer a bright, clean output and feature fantastically accurate beam shaping plus two beam angles ranges, 15°-35° and 25°-50°, along with precision projection optics. The luminaire delivers theatrical effect and functionality as pattern, dichroic, glass and plastic filters enable the use of imagery, logos, texture, colour and depth. In addition the Selecon Display Profile has the capability to manage, record and maintain design specifications, control and consistency." Not only that, the compact, clean look of the Selecon fixtures makes them ideal for the //hapo environment. They are reliable and low-maintenance, which is crucial as some of the areas are pretty difficult to access and the lighting is running for long periods of time. Randall assisted in specifying the fittings and allocating units to each zone. "Some of the areas called for low-level accent lighting on the displays, others featured graphic panels that required even illumination," explains Randall. "We required a large number of fittings that could offer precision optics, energy efficiency and cost-effectiveness. There were very few opportunities for any dynamic effects, so being able to use colour, gobos and precise focus was very crucial." The Selecon Display luminaires impressed Randall: "The flat field of the beam is really useful and especially helpful when lighting graphic panels. The framing shutters are great and the locking mechanism on the shutters ensures the focus of the fitting remains true for as long as possible. The range of beam angles available is also helpful. In this case it meant we could specify the right beam angle for each job without losing too much light by being forced to adjust the zoom optics too wide. They're also easy to focus and their elegant design makes them ideal for this application." Digital Fabric specified minimal dimming in the museum, so required fittings that would be bright enough to light the exhibits but not be too overpowering in the space. "The Selecon range enabled us to keep the same design of fittings throughout the space," explains Oliver, "but at the same time we could opt to change the power of the light sources as required." The result is both absorbing and inspirational. //hapo represents the creativity, inventiveness, resilience and spirit of the South African people. For those who have contributed to its creation, there is obvious pride.